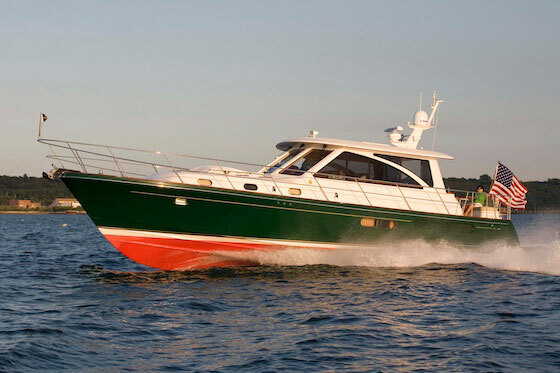 This Hunt Yachts 44 is an amazing opportunity to own a beautiful, one owner Yacht. 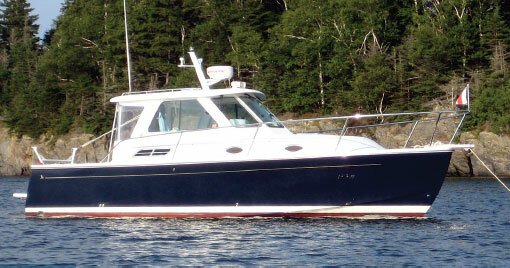 This Hunt Yachts 44 has been extremely loved and very well maintained. She has a galley down, two staterooms and one pull out. The current owner has upsized and needs to find her a home that will love her as much as he does! *Hull lamination • vinylester-infused PVC foam.cored laminate above and below water line. *Hull structure - lightweight composite FRP stringers and webs. *Engine-bed structure - stringer design with high­ density foam. *Deck lamination - vacuum-bagged PVC foam core for vertical and horizontal areas. *Deck and housetop structure - composite FRP beams and frames. *Deck-hardware installation - high-density core in way of hardware. *Deck-hull joint - fully bonded and mechanically fastened. *Bulkheads, structural - vacuum-bagged cored composite. *Cabin soles, structural - vacuum-bagged cored composite, with sound-proof features. Teak and Holly surface. *Gelcoat - white for deck. Bottom paint and antifouling. *Air conditioning: Cruisair® self-contained system; (3)zones. *Bilge pump, manual Whale diaphragm. *Bilge pumps, automatic: (3) Rule® submersible. Custom build counter system. *Bilge pump: ARID Bilge Systems - 4 Zone (3) zones; 24V DC. Pumps fitted with high-water switches and alarms. *Bow thruster: Lewmar® 185TT6.0 8.0 HP; 24V DC. *Controls: Single station; electronic, with synchronizer and trolling valve control. *Discharge pump: For black water tank, 24V DC. Engine mounts: Rubber Design® heavy-duty isolation mounts. *Engine room access: Via ladder and hatch in saloon sole. 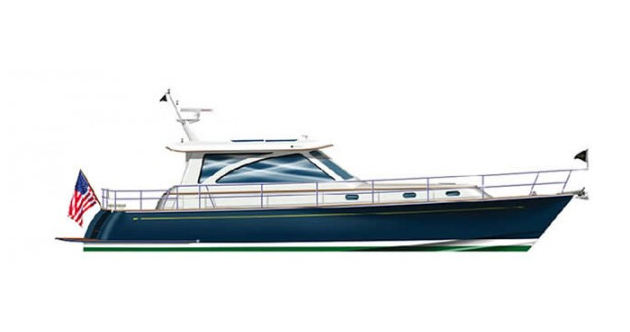 *Engine room air intakes, external: Manship® aluminum louvers painted to match hull topsides. *Engine room air intakes, internal: Della-T® Mist Eliminators in yard-built plenums with overboard drains. *Engine room finish: White; flow coated gel coat and brushed Awl-Grip® . *Engine room sole: FRP composite panels with non-skid surface. *Exhaust system, generator: Gas/ water separator. *Exhaust system: Custom stainless steel risers. isolation-mounted FRP mufflers, FRP tubing, high-temperature silicon rubber exhaust hose. 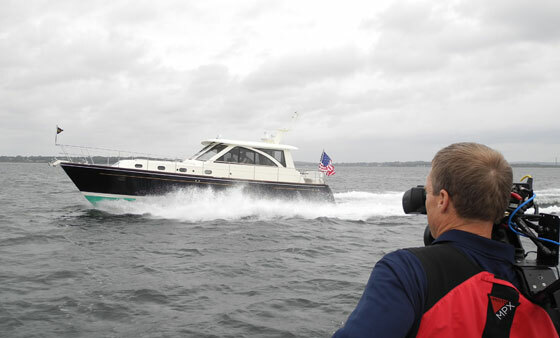 Discharge at transom corners. *Filter: Freshwater, ice maker, galley sink. *Fire extinguishers: (2) Sea Fire® C-20; at galley, helm. (3) Sea Fire® C-50; in engine room, tender garage, tazarette. *Fire protection system, engine room: Seafire® FM-227 automatic system with manual override, automatic engine shutdown. *Fuel filters: Racor® dual water separators for engines; single separator for genset. *Fuel hose: Fill, supply, return, vent; approved Type A1 and A2. *Fuel tanks: (2) of 5086 aluminum alloy, 450 USG total capacity. *Instrumentation, helm: Single station; start/stop with electronic digital/ analog displays. *Pump, fresh water: Variable pressure; 24V DC. *Regulator, fresh water: For dockside water connection. *Sea strainers, external: For engines, genset. air conditioning pumps. *Sea strainers, internal: For engines, genset, other intakes. *Seacocks, engines: Groco Safety Seacocks® for engine raw water intakes. *Seacocks, general: On thru-hulls below and above waterline; double-clamped hoses. *Soft patch: For engine removal; in saloon sole. *Sound insulation, engine room: Composite panels with dampening, barrier and absorption layers. *Spare parts kit: For engines, genset, other machinery. *Steering system: Power-assisted hydraulic with autopilot connection points. *Tank gauges: For fuel, water and waste tanks; 24V DC. *Tank, black water: FRP composite; 40 USG capacity. *Tanks, fresh water: (2) FRP composite with FDA­ approved resin. 120 USG total capacity. *Toilets: SeaLand® 24V DC; freshwater flush. *Trim tabs: Stainless steel with twin actuators; single station control with tab position indicators. *Vents, fuel tanks: For each tank; anti-spill vent filters. *Vents, tanks: For freshwater and black water tanks. Washdown, fresh water: Spigot at swim platform. *Washdown, salt/fresh water. Spigot at foredeck. *Water heater: lsotemp® Basic 40 11 USG: 115V AC. *Water system, fresh: Engineered plastic piping and fittings. *AC system: 115 VAC, 230 VAC. *Alternator, generator : (1) 12V DC. 60 amps. *Alternators, engines: (2) 24V DC, 120 amp. *Batteries: House Mastervolt MLI Ultra 24/5000 Lithium-ion phosphate 24V. Engine group 31 X 4. Bowthruster group 31 X 2. *Battery boxes: SS hold down brackets. *Battery chargers: Mastervolt ChargeMaster 24/100-3, Victron 12V 20AMP. *Battery condition indicator: BEP Marine Display, Mastervolt MV Easy. *Battery switches: With emergency paralleling capability. *Bonding system: For all metal parts; zinc anodes. Smoke detectors: In each stateroom, galley and saloon; 24V DC. *DC system: 12V DC, 24V DC. *Inverter: Mastervolt Mass Combi 24/2500-60. *Downlights. accent lights, indirect lights, reading lights: 24V DC. *Outlets & switches: Vimar® decor colored covers, mounting frames, modular switches and UL boxes. Outlets, galley, aft deck, engine room and head: 115V AC with GFCI circuit protection. *Panels: AC systems; DC systems; battery management; gensets. Panel locations T.B.D. Shore power cable: Glendinning Cablemaster®; 50 ft. white Hubbell® cable, 50 amp. *Shore power isolation transformer: 230V AC. Spare parts kit. *Wire fittings: Marine grade terminals, connectors, fuses, fittings and conduit. *Blinds: Ondeckhouseside and aft windows, stateroom portlights. *Cushions, mattresses: Premium quality laminated foam with fabric coverings. *Decor package: Pillow shams, pillows, duvets for staterooms; settee fabrics, throw pillows for deckhouse. *Doors, cabin: Cherry, veneered panels with solid frame, chrome door hardware, door stops. *Doors, locker: Cherry, veneered panels with solid frame, concealed hinges. positive locks. *Drawers: Veneered panel with solid frame, slides, positive lock knobs. *Grab rails: Wood and stainless steel. *Hanging lockers: Cedar lined; micro switches for LED closet lights. *Hardware, general: Stainless steel and chrome. *Headlinings: Foam backed fabric panels, removable. *Insect screens I blinds: Oceanair® retractable for deck hatches in staterooms. *Insect screens: Removable for opening port lights. *Lighting, lmtra® LEO and incandescent: Downlights, • accent lights, indirect lights, reading lights; 24V DC. *Outlets and switches: Vimar®, decor colored covers, mounting frames, modular switches and UL boxes for outlets. *Paint, interior: All hidden surfaces beneath and behind lockers, berths, settees, and other furniture. *Soles, deckhouse: Laid teak and holly, satin finish. *Soles, staterooms: Teak and Holly. *Stairs: Cherry, with clear non-skid varnish on treads. *Varnish, interior: Marine varnish. Satin for panels, soles; gloss for trim. *Wood, interior: Cherry veneers and quarter 4 sawn solid stock. *Chair, loose: Upholstered, with non-skid feet. *Chart desk: Opposite to helm. *Companion, forward: Provides access to forward accommodation. *Helm console: Teak. Full function with controls, instruments, alarms, rudder angle indicator, compass. • thruster and windlass, etc. Provision for navigation electronics. *Seat. companion: Custom hi-low banquette with foot­ rest and reversible seatback. *Seat, helm: Custom sliding banquette with footrest; icemaker and stowage beneath. *Settee: Built-in, with stowage beneath. *Table: Varnished teak top with stainless steel hi-Iow assisted pedestal. *TV: LCD HDTV with controlled electric lift, 115V DC. *Windshield defroster: For helm window; Runs off HVAC system. *Drawers: For cutlery and stowage. *Exhaust fan: Above cooktop, 115V AC. *Lockers: Beneath countertop, outboard of countertop. *Microwave: Stainless steel, 115V AC. *Refrigerator/freezer: U-Line U-C2275DWROL drawers mounted beneath galley counter, 115V AC. *Sink: Polished stainless steel single bowl; under mounted. *Trash container: Slide out plastic bin. *Berth: Tapered queen-size with drawers and top­ access stowage beneath. *Bureaus: (2) with drawers and lockers; port and starboard at hull sides. *Hanging lockers: (2) cedar lined; micro switches for LEO closet lights. *Mirror: Full length on stateroom door. *Portlights: (2) opening in stateroom. *Hanging locker: Cedar lined; micro switch for LED closet light. *Portlights: (1) opening in stateroom. *Settee/berth: 2- Twin beds convert to Queen. *Head accessories: Towel racks, rings, hooks, soap trays, toothbrush holder. vanity mirror, toilet paper holder. *Head stowage: Linen locker with shelves outboard of shower; drawers and locker beneath vanity; lockers above vanity. *Portlights : (1) opening in head. *Shower fixtures: Single- lever anti-scald type with rail 4 mounted hand-held shower head. *Shower pan: Moulded FRP. Shower sump: 24V DC. *Sink fixtures: Kohler®single-lever with pop 4 up drain Sink: Vitreous china, under mounted. *Access:Via hatches from aft deck. Exhaust blower: 24VDC. *Lazarette finish: White; flow coated gel coat and brushedAwl4 Grip®. *Lazarette vents: Louvered, in aft deck settee. *Stowage: For fenders, deck gear, etc. *Air horn: Kahlenberg ® SO single trumpet, 24V DC. Chocks: Custom stainless steel castings. *Doors, aft saloon: (1) Manship® bi-parting, stainless steel sliding doors with fixed, full-height windows. *Flagstaffs, bow & stern ensign: Custom teak. *Grab rails; Stainless steel tube. *Guard, quarter: Heavy-duty vinyl extrusion painted to match hull topsides; stainless steel half-oval striker. Guard, sheer; Heavy-duty vinyl extrusion painted to match hull topsides; stainless steel half-oval striker. *Hatches, accommodation : (1) Manship® LDH-60 I 24• X24";(2) Manship® LDH-40 11 6" x 16 ". Hatches fitted with Oceanair® screens/blinds. *Lights, courtesy; LEO, 24V DC. *Lights, navigation: On light mast, on deckhouse roof; LED, 24V DC. *Mast: Aluminum; provides mounting for antennae, light mast. *Portlights : (6) Manship® LSO-0716A 7" x 16" stainless steel, opening, with screens. *Safety rails: Upper and lower; stainless steel tube and wire. 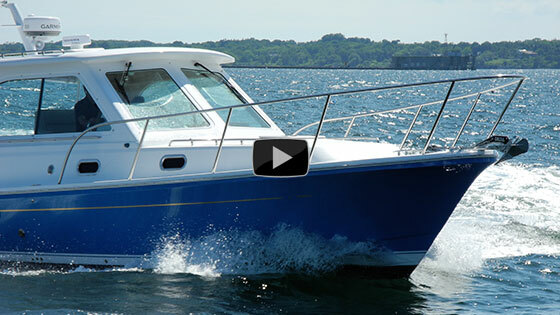 *Sunroof, hardtop: Trend Marine® flush; 24V DC. Fitted with Oceanair® blind. *Varnish: Marine varnish on alt exterior teak. *Windows, deckhouse front: Clear tempered fritted glass; fixed. Direct-glazed without frames. *Windows, deckhouse side and aft: Tinted tempered fritted glass; fixed. Direct-glazed without frames. *Windows, deckhouse side: Center section drop-opening, port and starboard. *Windshield wipers: Pantograph for all front windows. Variable speed, auto park, fresh water wash; 24V DC. *Anchor locker: Self-draining, with access hatches. *Anchor roller: Custom stainless steel fabrication with single roller. *Windlass accessories: Chain stopper, snubber, deck chafe plate. *Windlass: Maxwell vertical rope/ chain; 24V DC. *Cushions: Marine grade non-absorbing soft foam with vinyl coverings. *Deck flood light: At aft end of roof overhang. *Entertainment: DVD Player, Salon tv 19", Master tv 19", Guestroom tv 19". Bose Bluetooth connector on stereo, connects to any bluetooth device. *Hatches, lazarette access: (2) port and starboard. *Outlets: 115VAC with GFCI circuit protection. *Swim platform access: Via stairs port & starboard. *Table: Varnished teak top with stainless steel hi-lo pedestal. *Cleats: Retractable type; stainless steel. *Platform: Partially integral FRP molding. *Swim ladder: Undermounted; stainless steel tube. *Transom shower: Hot and cold with retractable hose. *Washdown, fresh water: Adjacent to shower. *Door: On transom centerline; electro-hydraulic operation with hand-held remote control, 24V DC. *Garage: Moulded FRP compartment; watertight to vessel interior. *Launch/retrieve: Windlass with hand-held remote control, 24V DC . *Tender: See OWNER OPTIONS. Exhaust blower: 24V DC.